Blog/Interview: In an extensive and heartfelt interview with the International Campaign for Human Rights in Iran, Shiva Nazar Ahari’s mother, Shahrzad Kariman, shared memories, anecdotes, and information about her daughter and her life. Shiva Nazar Ahari is a human rights activist who has been at Evin Prison for the past ten months. She was arrested twice over the past year, the first time the day after the 12 June 2009 presidential election. Mrs. Kariman says Nazar Ahari’s blank arrest warrant was dated a whole week before the election. She added that Nazar Ahari has never done anything against the law and that she and her husband have fully supported their daughter’s human rights work. In 2009, she continued her activities with Women’s Convergence Group during the presidential election campaign. There were many civil society women activists from different backgrounds, beliefs, and organizations. They mailed out brochures to different presidential candidates’ headquarters, listing women’s demands; they send them to the campaign headquarters of Mahmoud Ahmadinejad, Mohsen Rezaei, Mir Hossein Mousavi, and Mehdi Karroubi. The Women’s Convergence Group would then go to different campaign headquarters and describe their plans and debate about them. “This all continued until the day the elections results were announced and everyone returned to their homes,” Shiva Nazar Ahari’s mother said. As the vote counting ended, arrests of political and civil society activists started. Shiva was arrested during the first wave of arrests. “It was 2:00 a.m.on the day after the results were announced. Ministry of Intelligence men came to our home. Shiva wasn’t home, so they went to her office. Shiva was arrested on 14 June, 2009, but her warrant was dated a week prior to that, 6 June 2009. Her name was added to the warrant later,” she said. Arrests with “blanket arrest warrants” issued several days prior to the election is a shared theme among the arrest cases of many who were imprisoned after the election. Her detention lasted more than three months. “This was the arrest where we were not allowed to see her for 80 days. 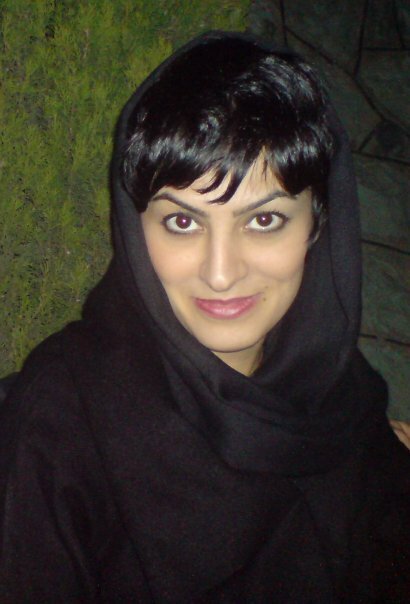 I went to Evin Prison every week, but each time they told me that she was not allowed to have any visitors. She called me 25 days after her arrest to tell me and said: ‘I’m well, Mom. Don’t worry for me. I am in solitary confinement in Ward 209.’ After this, I didn’t hear from her again for another 15 days. Then she called again and during a very short conversation she said: ‘Mom, I won’t be able to call you for two to three weeks now, but don’t worry for me.’ Eighty days went by and then I was allowed to see her in person in the presence of the ‘case specialist’ who worked with Shiva. Up until that day I didn’t know that the ‘case specialist’ had been changed, and I thought the same guy was still in charge [of her interrogation]. When we went to the visitation hall and saw that gentleman, I realized he is the same man who had come that night with the other security forces. Shiva said he is my new “case specialist.” In the end, Judge Sobhani told us to raise her $500,000 bail release her. For a whole month we kept going back to the Revolutionary Courts to get the $500,000 bail amount reduced, because our family could not afford it. In the end the bail was reduced to $200,000 and we still couldn’t afford it. This is when Shiva’s grandfather submitted the deed to his home as collateral,” her mother said. Shiva Nazar Ahari was released on 23 September 2009. “But she was not free long enough even for a good visit,” said her mother. On 20 December of the same year, she was arrested when she, along with her companions, were on their way to Ayatollah Montazeri’s funeral. This time she was able to contact her family the next day. “The telephone rang and she said ‘Don’t worry, I am at Evin Prison.’ I asked her on the phone, ‘Is it possible not to be worried? You didn’t even taste your freedom and you were arrested again?’ Two or three days later she called again and she was not feeling well at all. I had already heard her voice, but I was constantly anxious and I told her ‘Your voice doesn’t sound good at all. Are you sick?’ She said ‘No, I’m not sick.’ The first week we went to visit her they did not allow it, but the second week we met her. When I saw her skin color I asked her why she was so pale. Her general health was very bad, as if she had to make an effort to stay on her feet. She said ‘I am on a dry hunger strike, because they arrested me without cause. I had not done anything.’ Her father was very upset and said, ‘For our sakes, please do not do this. You are now forced to stay in prison, but I beg you not to go on strike. At least while you are here stay healthy.’ She promised to end her strike. I just told her, ‘Have you thought about what I should do if something happens to you?,'” recalled Shahrzad Fariman. “She said, ‘When I was arrested I was in such a bad shape that I didn’t do any thinking. I was only thinking that I was arrested without any cause, and I was arrested again without any grounds.’ After that, she was in solitary confinement again for 60 days when the weather was very cold. Even though Shiva never had a problem with cold, and during her 25-year-life she would always complain about the heat, it seems the prison was so cold that every time I talked to her she said, ‘Mom, it is very cold here.’ We could not take her any warm clothes. I knocked on any door I could think of to give my kid two sets of warm clothes, or two pairs of socks, but it did not happen,” added Nazar Ahari’s mother. “The New year arrived and at the time when a lot of the prisoners were being released, I thought Shiva might also be among them, but she was not. From 20 December, when Shiva was arrested, to 23 March, her “case specialist” only allowed one meeting in person in the courtyard of Evin Prison, to which we went along with the family. He called at 10:30 a.m. and said to be there by 11:00 a.m. I said we could not get there so fast, because our distance is too far away from Evin Prison. We saw her for the first time after three-four months. Then, in-person visits became regular, but we could only see her through the cabin, and once a week she was allowed one phone call. All this time she remained in Ward 209. Once every two months her temporary detention order expired, but it was extended again. There was no news of the trial or the Prosecutor. Shiva remained in prison, and we kept staring at the calendar, and every day we said there would be some news by the end of this week, and we were hoping that they would release Shiva. Her birthday also came and went, but Shiva was still in prison,” she added. Currently, seven months have passed since Shiva Nazar Ahari’s arrest. She was transferred to the General Ward after six months, to a cell, which according to her is a room that she shares with three or four other political prisoners. According to her mother, she has never complained about her situation, not about the prison guards’ treatment, nor about the food. Nazar Ahari’s family was told that her two court cases would be conjoined in Branch 26 of the Revolutionary Court by 23 May 2010. “Mr. Pirabassi, the presiding judge of this branch, had promised to conjoin the cases within a week and to return it to the court again. From that date until today, ‘the week’ has not ended yet for her case to go back to the court and for her situation to be clarified,” said Nazar Ahari’s mother.